For other people with the same name, see Luis Castillo. Luis Antonio Castillo (born September 12, 1975) is a former Major League Baseball second baseman. Castillo is a three-time All-Star, three-time Gold Glove winner, and won the World Series with the Florida Marlins in 2003. He is also the only player who played for the Marlins in both of their World Series winning seasons who did not get traded in between the two seasons. On August 19, 1992 Castillo was signed as a non-drafted free agent by the Florida Marlins. In 1994 he played his first year of baseball in the Gulf Coast League, playing for the Gulf Coast Marlins. He also set a Marlins short-season record in stolen bases, with 31. In 1995, he was called up to the Kane County Cougars in the Class-A Midwest League, and was selected to the All-Star team. He injured his shoulder in July, causing him to miss the rest of the season. That year, he led the entire Marlins organization in batting average with .326, as well as being second in stolen bases. Castillo spent most of the 1996 season in the Eastern League, but was called up to the Marlins mid-season and made his major league debut on August 8. His first major league hit came in a game against the New York Mets, where he knocked in the game-winning run in the 10th inning. He was named to the Eastern League All-Star team and post-season All-Star team. Castillo started playing full-time for the Marlins at second base during the 1997 season. Both at age 21, he and Édgar Rentería were the youngest middle infield combination in the history of the National League. He bruised his left heel mid-season, and missed the entire month of May with the injury. He was optioned to the Triple-A Charlotte Knights on July 28 and did not come back to the major leagues until the next season. Due to this, he did not play for the Marlins during the 1997 World Series. Castillo remained with the Charlotte Knights until being recalled to the Marlins on August 4, 1998. While in Charlotte, he had a streak of 32 consecutive games reaching base safely. With the Marlins, his highest hit streak was eight games, between August 14 and August 19. By the end of the season, he was third among Marlins minor leaguers in stolen bases, and a .203 batting average, 3 stolen bases and 10 RBIs. Castillo improved in 1999, with many short hitting streaks. These streaks included six games from May 10 to May 17, and six games from August 1 to August 7. He also had a 22-game hitting streak in a stretch between August 9 and September 3. He finished fourth in the league in stolen bases, and was fourth among leadoff hitters in on-base percentage at .385. He was named the Marlins Most Valuable Player by the South Florida Chapter of the Baseball Writers' Association of America. Castillo started the 2000 season with a seven-game hitting streak from April 5 to April 12, though he was placed on the disabled list with a strained back shortly afterwards. A week after coming back, he set a single-game team record with four stolen bases on May 17. He had 3 in the next game, falling short of the National League record of 8 in two games, set by Walt Wilmot in 1894. In 2000 he also became the Marlins all-time stolen base leader by stealing his 116th career base on June 20 while playing the Milwaukee Brewers. He finished the season with 62 stolen bases, leading the entire major leagues. In 2001, Castillo had two hitting streaks, 8 games from May 6 to May 13, and 14 games from June 29 to July 22. He finished fifth in the league in stolen bases with 33. He also had a .263 batting average, 45 RBIs, and 10 triples, a career high. In 2002, Castillo had a 35-game hitting streak, which is the longest ever by a second baseman (since matched by fellow second baseman Chase Utley of the Philadelphia Phillies in 2006). This was the sixth longest streak in the history of the National League, and also the tenth longest in the history of Major League Baseball. Castillo played second base in the 2002 All-Star Game, the first All-Star selection of his career. In 2002 he hit .305 with 39 RBIs and 48 stolen bases, leading the league in stolen bases for the second time in his career. He was again named the Marlins Most Valuable Player by the South Florida Chapter of the Baseball Writers' Association of America. Castillo was a member of the National League All-Star team in 2003, his second career All-Star selection. He also led the Marlins in hitting and won his first career Gold Glove Award. Castillo was a central figure in the NLCS Game 6 comeback by the Marlins against the Chicago Cubs at Wrigley Field after a foul ball that he hit was knocked away from the Cubs' Moisés Alou by fan Steve Bartman. The Marlins went on to win that game as well as Game 7 to get to the 2003 World Series, in which the Marlins defeated the heavily favored New York Yankees. This was the second World Series of Castillo's career, but the first in which he actually played. In 2004, Castillo had a .291 batting average with 47 RBIs, a career best. He also had 2 home runs and 7 triples. He was second only to Juan Pierre on the Marlins with a .373 on-base percentage and set a Marlins record with his 425th career walk passing Gary Sheffield's previous mark of 424. Castillo won his second straight Gold Glove and posted the National League's second-best fielding percentage at second base (.991), behind Philadelphia's Plácido Polanco. In his final season with the Marlins, Castillo won his third Gold Glove award in a row. He led the majors in batting versus left-handed pitchers with a .423 average. Castillo was also a member of the 2005 National League All-Star team, and replaced Jeff Kent of the Los Angeles Dodgers at second base in the 2nd inning. He was traded to the Minnesota Twins on December 2, 2005, in exchange for two minor leaguers, Scott Tyler and Travis Bowyer. The Marlins replaced Castillo at second base with Dan Uggla, a Rule 5 selection from the Arizona Diamondbacks. 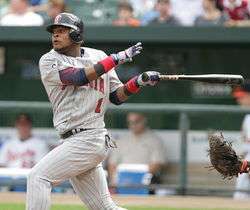 In 2006 Castillo began his only full season playing for the Minnesota Twins. He had an impressive first month of hitting, batting .432 with 19 hits. Over that stretch, Castillo drove in runs in five straight games from April 13 to April 19. Castillo had three four-hit games for the Twins this season, on April 15, August 5, and August 9. He had a six-game hitting streak from May 6 to May 13, and recorded his 300th career stolen base while facing the Chicago White Sox on August 26. 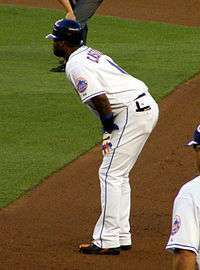 In the 2007 season Castillo set a new Major League Baseball record, going 143 games at second base without an error. He also recorded his 1,500th career hit on May 29 while facing the Chicago White Sox. Castillo was traded by the Twins to the New York Mets on July 30, 2007 for two minor league players, catcher Drew Butera and outfielder Dustin Martin. He finished the season with a .301 batting average with 1 home run, 38 RBIs and 19 stolen bases. On November 18 the Mets re-signed him to a 4-year contract worth a reported $25 million. Castillo had a strong finish to the 2007 season after being traded. He reached base safely in 40 of his last 46 games, and scored 34 runs in his last 42 games. In 50 games as a Met, Castillo batted .296 with 20 RBIs and 10 stolen bases. In 2008, a year plagued with injuries and several bench stints, Castillo hit .245 in 87 games, but still managed to steal 17 bases in 19 attempts. In 2009 spring training Castillo led all major league players in walks, with 17 from 56 official at bats. On March 16, 2009, Castillo was presented the opportunity to bat right-handed instead of being a switch hitter. He declined, and continued to be a switch hitter throughout the rest of his career. Although the Mets struggled as a team, Castillo enjoyed a bounce-back year in '09, hitting .302 with 77 runs scored and a .387 on-base percentage. On June 12, Castillo dropped a popup from Alex Rodriguez for a two-run game ending error at Yankee Stadium, earning him a measure of infamy in the Mets–Yankees rivalry. 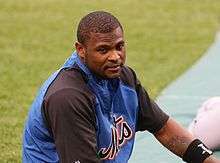 On June 4, 2010, the Mets put Castillo on the DL because of problems in both his feet. He was replaced by Rubén Tejada who played at second base in the Mets' 5–4 win against the Florida Marlins at Citi Field. He was criticized along with Carlos Beltrán and Óliver Pérez for not going to the hospital that had soldiers who had amputated arms and legs, he claimed that he did not want to be horrified by the experience. Castillo commented on not being happy with his playing time and "has to work something out this offseason". During Spring training of 2010, he was booed by the home fans at Digital Domain Park where the Mets play their spring training games. He was released from the Mets spring training roster on March 18, 2011. On March 21, 2011, Castillo signed a minor league deal with the Philadelphia Phillies. On March 22, he reported to Phillies training camp. Castillo was released shortly thereafter on March 30, 2011. Castillo graduated from the class of 1991 at Colegio San Benito Abad in the Dominican Republic. He is married and has two children – Luis Jr., born on October 12, 2001, and Adonai, born on July 30, 2009. 1 2 3 4 5 6 7 8 9 10 11 12 13 14 "Luis Castillo Biography and Career Highlights". MLB.com. Retrieved April 5, 2009. ↑ Sanchez, Jesse (May 27, 2004). "Castillo trying to live up to legacy". MLB.com. Retrieved May 1, 2010. ↑ New York Times "Castillo Hit Streak Ends at 35". The New York Times. June 23, 2002. Retrieved November 22, 2007. ↑ Frisaro, Joe (July 6, 2004). "Willis finds his groove to beat Bucs". MLB.com. Retrieved May 1, 2010. ↑ "Marlins trade Castillo to Twins for two pitchers". ESPN.com. Associated Press. December 2, 2005. Retrieved January 13, 2015. ↑ "Castillo sets errorless streak at 2B". Minneapolis Star-Tribune. Retrieved May 27, 2007. ↑ Noble, Marty (July 31, 2007). "Mets unable to land reliever at deadline". MLB.com. Retrieved August 22, 2014. ↑ "Player News". CBS SportsLine. Retrieved November 23, 2007. ↑ McCullough, Andy (July 30, 2009). "Second baseman Luis Castillo back in lineup for second game of NY Mets doubleheader". The Star-Ledger. Retrieved July 30, 2009. Wikimedia Commons has media related to Luis Castillo (baseball).